The Eurocopter EC145 (now Airbus Helicopters H145) is a twin-engine light utility helicopter developed and manufactured by Eurocopter, which was rebranded as Airbus Helicopters in 2014. Originally referred to as the BK 117 C2, the EC145 is based upon the MBB/Kawasaki BK 117 C1, which became a part of the combined Eurocopter line-up in 1992 with the merger of Messerschmitt-Bölkow-Blohm's helicopter division of Daimler-Benz and the helicopter division of Aérospatiale-Matra to form Eurocopter. The EC145 is a twin-engine aircraft and can carry up to nine passengers along with two crew, depending on customer configuration. The helicopter is marketed for passenger transport, corporate transport, emergency medical services (EMS), search and rescue, parapublic and utility roles. In 2015, the EC145 was rebranded as the H145 by Airbus Helicopters. Military variants of the helicopter have also been produced under various designations, such as H145M or UH-72, and have been used for training, logistics, medical evacuation, reconnaissance, light attack, and troop-transport operations. The EC145 was a joint development between Eurocopter and Kawasaki Heavy Industries on the basis of their successful prior jointly produced BK 117 C1. Rather than pursuing an entirely clean sheet design, the forward cockpit and modern avionics of Eurocopter's EC 135 were adopted in combination with the proven BK 117's rear section; Flight International described the new helicopter, originally designed as BK 117 C2, as being "90% a combination of these two aircraft [The EC135 and BK 117 C1]". However, there were significant areas of redesign, advantages held by the EC145 over its predecessor include possessing a greater range and payload capacity, a considerably increased and uninterrupted cabin area, reduced vibration and noise emissions, and measures to simplify maintenance and minimise operational costs. The noise signature of the EC145 is reportedly 60% lower than that of the BK 117 C1. The new model was type-certificated as the BK 117 C2; in December 1997, it was selected by the French Defense and Civil Guard for air rescue mission, 31 EC145s were ordered to replace their fleet of ageing Aérospatiale Alouette III in a deal costing $170 million. The first EC145 completed its maiden flight at Donauwörth, Germany on 12 June 1999; Eurocopter conducted a major publicity event for the emerging type at the US Helicopter Association International Show in February 2000. Safety certification of the EC145 was awarded by the German Luftfahrt-Bundesamt and Japanese Civil Aviation Bureau in December 2000; and by the United States Federal Aviation Administration (FAA) in early 2002. Eurocopter and Kawasaki have an agreement under which both firms independently manufacture and market the rotorcraft, while working collaboratively on development and upgrades. Eurocopter has a 60% production workshare, which includes the main and tail rotors, intermediate and tail gearboxes, control systems, cockpit and tail structure, and landing gear; Kawasaki has a 40% workshare, comprising the fuselage structure, main transmission, electrical and fuel systems. Kawasaki uses the designation BK 117 C2 for the type and sells/produces the aircraft in the Asian market; Eurocopter sells the type globally under the EC145 designation. In November 2004, with the termination of production of Mitsubishi Heavy Industries' MH2000, the BK 117 C2 became the only civil helicopter in production in Japan. In August 2010, it was announced that the partnership between Eurocopter and Kawasaki on the development and production of the EC145 had been extended until at least 2025. In 2011, Eurocopter launched an upgraded EC145 model, designated EC145 T2, unveiling the new type at Heli Expo 2011. The EC145 T2 is designed to significantly increase the aircraft's performance, featuring new Arriel 2E turboshaft engines, dual-digital Full Authority Digital Engine Controls (FADEC), Eurocopter's Fenestron shrouded tail rotor design, and upgraded tail and main rotor gear boxes. Considerable differences and improvements were introduced to the cockpit and aircraft subsystems, including the adoption of increasingly digital avionics and a fully modular approach to these systems; amongst the biggest changes is a sophisticated 4-axis autopilot. In April 2014, airworthiness certification from the European Aviation Safety Agency for the EC145 T2 was received, FAA certification followed in October 2014. The primary manufacturing facility for the EC145 is located at Donauwörth in Germany, which is Eurocopter's second-largest site after Marignane in France. In 2014, Airbus Helicopters announced that 50 EC145 T2s would be manufactured in 2015; the production is expected to eventually rise to 70 helicopters per year. Since 2011, Eurocopter has been developing an optionally piloted vehicle (OPV) variant of the EC145. Test flights of the EC145 OPV, including unmanned flights, began in 2013. The system, designed to plug into the EC145's existing avionics, is capable of autonomous operation or alternatively being controlled by human operators either via the cockpit or from a ground control station. The technology, which is reported to be compatible with a number of Eurocopter's range of helicopters, is intended for both civil and military applications. In an emergency situation, such as systems failure, the EC145 OPV is programmed to enter into an automated hover-to-land procedure to safely land the aircraft. In March 2015, Airbus Helicopter's Chief Technical Officer Jean-Brice Dumont stated that there were no firm plans for the EC145 OPV to proceed to production, but investment in the project was continuing. In July 2014, Airbus Helicopter launched the EC145e, a lightened and lower cost version of the standard EC145, achieved by the removal of some avionics for autopilot and single-pilot IFR functions. Intended as a basic model for tasks such as aerial firefighting and utility work, it has been also viewed as a replacement for aging MBB Bo 105 rotorcraft. In April 2015, the EASA issued its certification for the EC145e. In 2015, Metro Aviation entered into an arrangement with Airbus Helicopters to offer various mission-specific customisations for the EC145e and operate as a reseller for the variant. The EC145 features a larger cabin space than the older BK 117 C1 helicopter with internal space increased by 46 cm (18 in) in length and 13 cm (5 in) in width, increasing cabin volume by 1.0 m³ (35 ft³) to 6.0 m³ (211 ft³). Other improvements over the BK 117 include an increased maximum take-off weight and greater range, achieved partially by the adoption of composite rotor blades, which were derived from the smaller EC135. The EC145 has a hingeless rotor system with a monolithic titanium hub; the helicopter was originally powered by a pair of Turboméca Arriel 1E2 turboshaft engines, later aircraft are powered by the upgraded Turboméca Arriel 2E engine. A key feature of the rotorcraft is the variable rotorspeed and torque matching system (VARTOMS), derived from the BK 117, which Eurocopter has attributed as making the EC145 "the quietest helicopter in its class". The EC145 is fitted with an all-glass cockpit, consists of a Thales Avionics MEGHAS Flight Control Display System with active matrix liquid crystal displays (LCDs); it can be piloted by either one or two pilots. A number of systems are independently redundant, including the autopilot system, hydraulic boost, transmission lubrication, and some of the onboard sensors. The EC145 T2 features additional and newer avionics systems, such as a full 4-axis autopilot and dual-channel Full Authority Digital Engine Control (FADEC); three large LCD primary displays were also introduced to control these systems. The type is fully capable of Category A operations; in November 2008, an EC145 performed the first medical transport flights under instrument flight rules (IFR) in Europe; the type is able to fly entirely under GPS navigation from takeoff to final approach when required. The EC145 is also the first civil helicopter to be fitted with night vision-compatible cockpit instrumentation and lighting straight off the production line. Typical cabin arrangements allows for eight passengers in a club seating configuration, or nine passengers in a high density seating configuration, passenger seating is designed for quick rearrangement based upon current demands. The cabin can be accessed either through sliding doors in either side of the aircraft or via large clamshell doors at the rear of the cabin; in combination with the high mounted tail boom, the clamshell doors are designed to provide safe clearance for loading and unloading activities even while the rotors are turning. In an EMS/casualty evacuation arrangement, the EC145 can carry up to two stretchered patients with three accompanying medical staff. The helicopter can be fitted with emergency floats, rescue hoist, search light, load hook and specialist equipment for other operational requirements. A specialised VIP variant developed in association with Mercedes-Benz, known as the EC145 Mercedes-Benz Style, launched as an executive helicopter in 2010. Capable of transporting up to six passengers via switchable rail-mounted seating arrangements; the Mercedes-Benz variant features a luxury interior complete with leather seats, wooden panelling, advanced ambient lighting and in-flight entertainment systems, and modular storage cabinets; various aesthetic external changes, such as a reshaped forward section, also feature on this variant. Eurocopter also offers an 'EC145 Stylence' package to corporate and private helicopter operators, which has various aesthetic and technology changes from the baseline model to provide a higher level of passenger comfort. The EC145e, a utility variant, has a deliberately standardised interior for the purpose of minimising overall weight. The French Sécurité Civile (Civil Guard), French Gendarmerie and the Landespolizei (State Police) of Hesse, Germany became the first operators of the EC145 upon receipt of the initial deliveries in April 2002. The Sécurité Civile procured the type as a replacement for its aging Aérospatiale Alouette III fleet, winning out against the Eurocopter AS365 Dauphin. In November 2006, the Sécurité Civile were planning to make greater use of the EC145's IFR capabilities for operations within bad weather and at night time. In 2008, the Gendarmerie reportedly stated that the EC145 has a per aircraft availability rate of roughly 90 percent. Out of a total of 32 EC145s delivered to the Sécurité Civile, three had been lost in accidents by June 2009. In October 2010, an agreement to establish a joint venture between Eurocopter and Kazakhstan Engineering, Eurocopter Kazakhstan Engineering, was formally signed; the joint venture created the only EC145 manufacturer in the Commonwealth of Independent States (CIS), which possesses exclusive rights to supply the type to Mongolia, Uzbekistan, Tajikistan, Kyrgyzstan, Belarus, and Azerbaijan. In November 2011, Kazakhstan took delivery of the first of an initial batch of six EC145 ordered. In September 2012, Eurocopter Kazakhstan received its first EC145 assembly kits at its newly established facility in Astana; up to 10 EC145s per year are to be built at the facility. By November 2015, a total of 20 rotorcraft had been produced at the Kazakhstan facility, 14 for the Ministry of Emergencies of Kazakhstan and 6 for the Ministry of Defense of Kazakhstan. In April 2012, Eurocopter announced that the 500th EC145 had been delivered. On 31 July 2014, the first EC145 T2, an updated variant, was delivered to its launch customer, DRF Luftrettung, who have ordered a total of 20 such helicopters for emergency medical service operations. In April 2015, Airbus Group Australia Pacific delivered its first H145, previously designated as the EC145 T2. In June 2015, it was announced that Saudi Arabia intended to purchase 23 H145s worth $500 million. In November 2015, it was reported that the H145 had attained an average availability rate of 94%. In 2006, the UH-145, a military variant of the EC145, was selected for the United States Army's Light Utility Helicopter Program, beating three other helicopters. The deal, valued at $3 billion, involved the supply and servicing of 345 helicopters, with options for additional aircraft. The variant was designated UH-72 Lakota by the US Department of Defense; the first UH-72A was delivered to the US Army in December 2006. In August 2007, the FAA authorised the commencement of production of both UH-72A and civil EC145 rotorcraft at American Eurocopter's facility in Columbus, Mississippi. In July 2013, Germany purchased 15 EC145s for the German Army to be used for special operations (KSK) designated EC645 T2. The EC645 T2 is armed with weapon mounts, fitted with electronic countermeasures system, ballistic protection, electro-optical system, fast rope system, cargo hooks and hoists. In October 2014, Thailand placed an order for 5 EC645 T2s for the Royal Thai Navy. On 27 November 2014, the maiden flight of the EC645 T2 was performed at Donauwörth, Germany. On 15 May 2015, the H145M, previously designated as EC645 T2, received EASA airworthiness certification. The first two H145Ms were received by Germany and assigned to the Air Force in December 2015. In December 2016, Serbia placed an order for 9 H145Ms with 6 for the Serbian Air Force and Air Defence, four of the six to be equipped with the HForce weapon system, and 3 for the Police of Serbia. In November 2017, Airbus completed the first test fire of the HForce modular weapon system. HForce will enable the H145M hardpoints to be armed with the M3P .50-caliber machine gun, M621 20mm automatic cannon and FZ231 70mm rocket launcher and will equip the H145M with a Wescam MX-15 electro-optical targeting system and Scorpion helmet mounted sight display. In December 2017, Airbus successfully launched FZ275 70mm semi-active laser guided rockets. In June 2018, an order was placed for 20 H145Ms by Hungary for the Hungarian Air Force equipped with HForce. In July 2018, an order was placed by Luxembourg for 2 H145Ms for the Luxembourg Army that will be dual role for use by the Luxembourg Police. EC145 intended for VIP and corporate purposes, outfitted with a luxury interior designed by Mercedes-Benz; seating four to eight passengers depending upon configuration. Variant of the base EC145 for utility purposes, featuring new Garmin G500H digital cockpit and the removal of some elements such as the automatic flight control system, along with the adoption of a standardised interior, for weight reduction purposes. EC145e is a marketing name for the BK 117 C-2e. Updated version of EC145, initially designated as EC145 T2. Features a conventional tail rotor replaced by a fenestron shrouded tail rotor. Other changes include the installation of more powerful (775 kilowatts (1,039 shp) Arriel 2E engines, and various new avionics. H145 is a marketing name for the BK 117 D-2. Militarised version of the H145; briefly designated as EC645 T2. It can be outfitted with ballistic protection, self-sealing fuel tanks, electro optical/infrared sensor, retractable pintle-mounted 7.62mm FN MAG machine guns or M134 miniguns, military-grade communications and navigational systems and an electronic warfare self-protection system. HForce weapon system for hardpoints scheduled to receive qualification in end of 2018. A militarised Light Utility Helicopter based on the basic EC145 model; operated by the US Army. As of September 2012, the EC145 is in service with a total of over 100 customers in 34 countries. Closeup of the old tail rotor of an EC145. Now replaced with a quieter alternative. ^ "Airbus - H145". www.airbus.com. Retrieved 25 July 2018. ^ Gray 2002, p. 30-31. ^ Wagstaff, Bill. "EC 145 bows in quietly." AIN Online, 21 May 2008. ^ Gray 2002, p. 31. ^ "Eurocopter/Kawasaki fly EC145." Flight International, July 1999, p. 22. ^ "A Marriage that Lasted." Flight International, p. 30. 31 May 2004. ^ "Low level of interest forces Mitsubishi to halt sales of MH2000." Flight International, November 2004, p. 23. ^ Sarsfield, Kate. "Eurocopter and Kawasaki extend EC145 partnership." Flight International, 2 August 2010. ^ a b "Eurocopter expands its product line with the EC-145T2 helicopter." Avio News, 7 April 2011. ^ Johnson, Oliver. "FAA certifies Airbus Helicopters EC145 T2." Vertical, 15 October 2014. ^ Gubisch, Michael. "IN FOCUS: Eurocopter steps up Donauwörth site." Flight International, 31 August 2012. ^ a b Perry, Dominic. "First Airbus Helicopters EC145 T2 handed to launch customer". Flight International, 1 August 2014. ^ Perry, Dominic. "Eurocopter demonstrates unmanned EC145." Flight International, 25 April 2013. ^ Osbourne, Anthony. "Eurocopter Tests Optionally Piloted Capability On EC145." Aviation Week, 25 April 2013. ^ Drwiega, Andrew. "Airbus Helicopters Endures Challenging Year of Change and Integration." Rotor & Wing, 10 March 2015. ^ a b Maher, Guy R. "When Less is More." Vertical, 29 October 2015. ^ Perry, Dominic. "Airbus Helicopters launches reduced weight EC145." Flight International, 31 July 2014. ^ a b "Technology." Archived 4 July 2013 at the Wayback Machine Eurocopter, Retrieved: 31 March 2013. ^ a b "Advanced Technology and Design." Archived 25 April 2013 at the Wayback Machine Eurocopter, Retrieved: 31 March 2013. ^ a b c d Bower, Ron. "Flying The EC145." Rotor & Wing, 1 April 2006. ^ "Eurocopter Teams With French Authorities To Test New Medevac Route." Aero News Network, 28 November 2008. ^ "Rotorcraft Report: Eurocopter Gets NVG Nod for EC145." Aviation Today, 1 August 2007. ^ a b Dubois, Thierry. "European medical operators give the EC 145 high marks." AIN Online, 30 October 2006. ^ Grady, Mari. "Airbus EC145 Mercedes-Benz Style Helicopter Makes U.S. Debut." Robb Report, 23 March 2014. ^ "EC145 Stylence." Airbus Helicopters, Retrieved: 25 December 2014. ^ a b Perry, Dominic. "EASA grants approval to EC145 utility helicopter." Flight International, 23 April 2015. ^ a b "EC145 500th of Eurocopter Ultimate" YouTube, 27 April 2012. ^ Briganti, Giovanni de. "Aircraft Operations: Taking the EC145 to New Heights." Aviation Today, 1 March 2008. ^ "Accidents & Incidents." Police Aviation News. ^ Dubois, Thierry. "French rescue org suffers third fatal EC 145 crash." AIN Online, 3 June 2009. ^ "Eurocopter Kazakhstan Engineering plans to launch a maintenance center for EC145 helicopters in Mongolia." Tengri News, 10 September 2012. ^ a b "Kazakhstan strengthens relations with Airbus Group." Azernews, 3 November 2015. ^ "Kazakhstan receives first EC145." UPI, 29 November 2011. ^ Francis, Leithen. "Eurocopter's Kazakhstan JV Receives First EC145 Kits." Aviation Week, 25 September 2012. ^ a b "Airbus delivers first H145 into this region." Vertical Magazine, 12 April 2015. ^ "Airbus H145 fleet accumulates 10,000 flight hours." Vertical Magazine, 4 November 2015. ^ "UH-72 Light Helicopter Win Lands Eurocopter in US Defense Market." Defense Industry Daily, Retrieved: 31 March 2013. ^ Sims, Paul. "Ready for flight. Eurocopter delivers first UH-72A to U.S. Army as world's media watches. "[permanent dead link] Starkville Daily News, 12 December 2006. ^ "American Eurocopter Receives FAA Production Authority for U.S. Army UH-72A Lakota and EC145 Commercial Helicopters." Business Wire, 29 October 2007. ^ a b "Germany's Special Forces Command Set to Fly Eurocopter's EC645 T2 Light Utility Helicopter". Airbus (Press release). 11 July 2013. Retrieved 9 October 2018. ^ "The Royal Thai Navy and Air Force acquire five EC645 T2 and two EC725 rotorcraft from Airbus Helicopters". Airbus Helicopters (Press release). 22 October 2014. Archived from the original on 27 October 2014. ^ "Airbus Helicopters hands over first two H145M to Royal Thai Navy". Airbus (Press release). 28 April 2016. Retrieved 7 October 2018. ^ a b "Successful First Flight of Airbus Helicopters' EC645 T2". Airbus (Press release). 27 November 2014. Retrieved 9 October 2018. ^ a b "Ready to serve: Airbus Helicopters' militarized H145M receives its on-time EASA certification". Airbus (Press release). 5 May 2015. Retrieved 9 October 2018. ^ "Airbus Helicopters delivers the first two H145M to the German Armed Forces". Airbus (Press release). 7 December 2015. Retrieved 9 October 2018. ^ "Republic of Serbia Orders Nine H145M". Airbus. 28 December 2016. Retrieved 7 October 2018. ^ a b Bozinovski, Igor (4 January 2017). "Serbia buys nine H145M helicopters from Airbus". janes.com. IHS Jane's Defence Weekly. Archived from the original on 21 June 2017. ^ a b "Airbus Helicopters completes first firing campaign with HForce-equipped H145M". Airbus (Press release). 9 November 2017. Retrieved 10 October 2018. ^ Perry, Dominic (30 July 2018). "Airbus Helicopters on target with HForce sales". Flightglobal. Archived from the original on 31 July 2018. ^ a b "H145M successfully launched 70mm Laser Guided Rockets during its firing campaign in Sweden". Airbus (Press release). 31 January 2018. Retrieved 10 October 2018. ^ a b "Hungary orders 20 H145Ms". Airbus (Press release). 29 June 2018. Retrieved 7 October 2018. ^ a b "Luxembourg Defence orders two H145Ms". Airbus (Press release). 27 July 2018. Retrieved 7 October 2018. ^ Quick, Darren. "Eurocopter premieres EC145 Mercedes-Benz Style luxury helicopter in Geneva." Giz Mag, 17 May 2011. ^ Broadbent 2012, pp. 67–68. ^ "Eurocopter Delivers the First EC145 to the Bolivian Air Force." Eurocopter, Retrieved : 31 March 2013. ^ "Bahia State Public Security receive EC145". helihub.com. Retrieved 1 March 2014. ^ "Bahia State Public Security receive EC145". helihub.com. Archived from the original on 2 April 2015. Retrieved 1 March 2014. ^ "O novo EC-145 da Secretaria de Saúde e do Corpo de Bombeiros de Minas". helihub.com. 7 October 2014. Retrieved 1 November 2014. ^ Pittaway, Nigel (February 2019). "H145 Mountie". Air International. Vol. 96 no. 2. p. 92. ISSN 0306-5634. ^ Mar 20, CBC News · Posted:; March 20, 2019 2:57 PM CT | Last Updated:. "STARS to buy new fleet with help from $65M in federal budget | CBC News". CBC. Retrieved 21 March 2019. ^ "Final EC145 delivered to the French Sécurité Civile". eurocopter.com. Archived from the original on 9 April 2013. Retrieved 10 March 2013. ^ "ADAC orders 14 EC145T2 and 3 EC135P2e". helihub.com. Retrieved 10 March 2013. ^ "Landespolizei EC145". Retrieved 10 March 2013. ^ "Lithuanian Border Guard orders Eurocopter EC 135 and EC 145". eurocopter.com. Archived from the original on 10 April 2013. Retrieved 10 March 2013. ^ "Lithuanian Border Guard Eurocopter EC 145". jetphotos.net. Retrieved 10 March 2013. ^ "Moroccan Royal Gendarmerie recognized for 50 years with Eurocopter". airbushelicopters.com. Archived from the original on 26 August 2014. Retrieved 22 August 2014. ^ "Namibian Police Order EC145". Air International. Vol. 81 no. 4. October 2011. p. 34. ISSN 0306-5634. ^ "Peruvian National Police order four EC145s". Helihub.com. Retrieved 4 November 2013. ^ "Philippine Coast Guard will be getting 1–2 Eurocopters EC145 to boost search and rescue operations". Zambotimes.com. Retrieved 7 June 2012. ^ "CORRECTED-France, Saudi Arabia to sign contracts worth $12 bln – Fabius". reuters.com. Retrieved 24 June 2015. ^ "Rega's EC-145 " HB-ZRF"". swissheli.com. Retrieved 10 March 2013. ^ "Srbija nabavlja 9 helikoptera H145M". tangosix.rs (in Serbian). Retrieved 4 January 2017. ^ "Ministry of Emergencies of Ukraine and Eurocopter sign contract for rescue and emergency missions helicopters". Eurocopter. 17 October 2008. Archived from the original on 9 April 2013. Retrieved 10 March 2013. ^ "New Air Ambulance Helicopters will Enhance Patient Care". scottishambulance.com. Retrieved 26 June 2015. ^ "Eye in the Sky – PSNI's New EC145 Eurocopter officially launched". psni.police.uk. Archived from the original on 29 August 2012. Retrieved 10 March 2013. ^ "University of Utah Health Care". Archived from the original on 29 June 2013. ^ "DPS to Showcase Past and Present Resources at Austin Museum Day". txdps.state.tx.us. Archived from the original on 19 November 2013. Retrieved 5 November 2013. 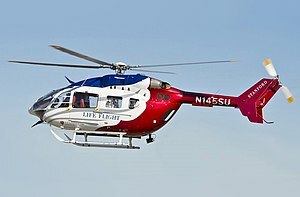 ^ "First Police H145 in USA Goes to Las Vegas". Helis.com. Retrieved 15 January 2019. ^ a b c d e "World Air Forces 2019". Flightglobal Insight. 2019. Retrieved 12 March 2019. ^ "French National Gendarmerie EC 145". Retrieved 10 March 2013. ^ "H145M LUH SOF". German Air Force (in German). 6 February 2018. Retrieved 6 October 2018. ^ Pittaway, Nigel (February 2019). "Heeresflieger search and rescue H145s". Air International. Vol. 96 no. 2. p. 19. ISSN 0306-5634. ^ RAF Website. "AIRBUS H145 JUPITER". www.raf.mod.uk. Retrieved 25 September 2018. ^ "Eurocopter EC 145 Technical Data" (PDF). Archived from the original (PDF) on 29 September 2007. Retrieved 17 July 2007. ^ EC145 Technical Specs Archived 7 May 2007 at the Wayback Machine, Eurocopter USA. Broadbent, Mark. "Eurocopter Tango Two". Air International, March 2012, Vol 82 No 3. Stamford, UK: Key Publishing. ISSN 0306-5634. pp. 66–69. Gray, Peter. "Flight test: Eurocopter EC145." Flight International, 11 February 2002. pp. 30–34. Wikimedia Commons has media related to Airbus Helicopters H145. This page was last edited on 25 April 2019, at 19:47 (UTC).